Have you ever wondered how balloon arches get their nice spiral pattern? It's a simple trick of arranging contrasting colours. Let's say you have a four balloon cluster in a red, white, red, white pattern. Attach the first cluster to the frame or fishing line. Now arrange the second cluster in the same colour pattern and attach it to the frame as well. 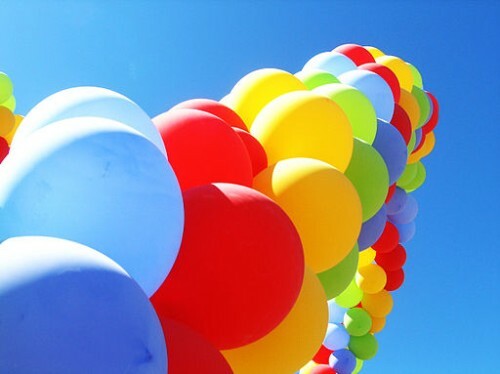 When you push up the second cluster towards the first one, rotate the balloons clockwise for about half a balloon, so that the balloons of the second cluster fit into the gaps between the balloons of the first cluster. Repeat this for the third and all following clusters, always rotating the clusters in the same direction. If you arrange the balloon clusters in a two white, two red pattern, you will get a double spiral effect, as shown for our "Spiral Column" decoration. These arches can be helium or air filled. Read more about the pros and cons of helium versus air here. For an air filled design, you will need two supportive elements: an arch shaped frame made of conduit, PVC pipe or aluminium rod, and two sturdy bases as anchors. Specialized balloon suppliers offer a variety of frames and bases. However, these suppliers are often wholesalers for balloon professionals, where you can't buy as an end user (e.g. All American Balloon Supply). An alternative would be to buy a balloon decoration kit, complete with frames, bases, balloons and instructions. This is a great solution if you just want to build a balloon arch once in your life and can't be bothered with getting all the bits and pieces together separately. Check out our exclusive selection of balloon decorating kits. If, on the other hand, you like the challenge of doing the whole thing yourself, you will find the necessary materials at a hardware store. Whereas for smaller and hanging designs, the 1/4" aluminium rod is strong enough, for a self-supporting walk through arch you will need 1/2" aluminium rod for the frame. If the frame has to be extra sturdy (e.g. for outdoor arches), it's best to use 1/2" conduit. It's more difficult to work with, but it will give your arch the sturdyness it needs. Every decorator has their own way to build the bases for arches or columns. Common materials are steel plates, plywood plates or cement blocks, with a pipe flange screwed, welded or glued to it. For an indoor decoration, a base made of timber or plywood is normally sufficient and relatively easy to put together. Please see our instructions for a self-made balloon column base. The following video shows how to create an arch with clusters of four balloons. It's an example of a helium filled arch. But the principle of arranging the clusters stays the same, whether you attach them to a fishing line or to a metal or plastic frame. The video also explains the use of "Hi-Float", a substance that extends the floating time of helium filled latex balloons.